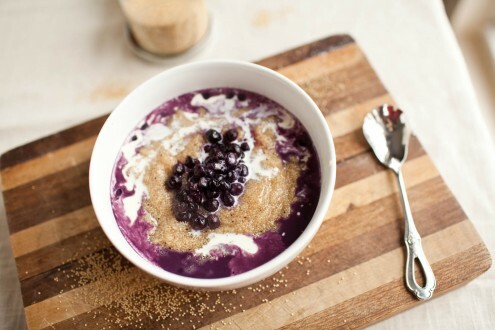 Blueberries 'n' Cream Amaranth Porridge | Naturally. I am one of those people that try and not judge at face value. I believe that people can change (if motivated to do so) and I believe for the most part people (and things) deserve a second chance. I know this can be naive but I prefer more to look at it in an optimistic way. Life is too full of disappointment to potentially pass up something that may have been okay on a second chance. People grow, mature, and taste change- nothing stays stagnant. And if the second time doesn’t work out, I feel the saying “you live, you learn” works well. Everything is a learning experience. Take for example my first experience with amaranth. I was a wide-eyed girl wanting to eat more unprocessed foods. I stocked up on various bulk bin items and I was determined to cook my way through them. I fell in love with quinoa, cooked up pounds of dried beans, and rekindled a love for oatmeal. But then there was amaranth. I had high hopes. The little power packed seed came from such a beautiful herb plant-how could it not be wonderful? I had a whole meal planned out for it but it flopped. Before I knew it, I had a pot full of mush and tiny amaranth seeds all over my kitchen. One chance and I was done. I had been happy I had tackled so much out of the bulk bin that one “failure” wasn’t going to hurt. I moved on and shoved my amaranth to the back of the cupboard. Then I ran across this pumpkin pie porridge on Sarah’s blog (My New Roots). Was I ready to give amaranth a second chance? With spring just around the corner I’m working on finishing the last of my harvest that I had frozen. I’d been saving these blueberries for something special and sure enough, this worked perfect. I cooked the amaranth, stirred the blueberries, and snapped away photos. It looked delicious but I still wasn’t sold. I needed a taste. Sure enough, the result was a delicious and extremely healthy breakfast that was truly soul satisfying. I gave amaranth a second chance and I’m glad I did. Sometimes it pays to be an optimist. 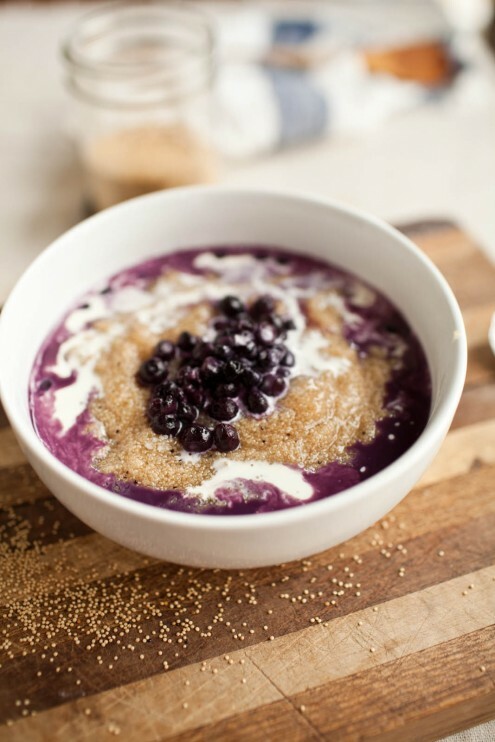 For a couple more great ways to use Amaranth I highly suggest you check out Maria’s blog (Scandi Foodie) for a recipe using fresh Amaranth and Ashley’s blog (edible perspective) for puffing amaranth and making cereal! I have amaranth in my cupboard, and really need to give it another try as well. Thanks for sharing! Never heard of amaranth, but this looks divine. Erin, I really wish I lived close to you. Love all your healthy ideas for food. I love freezing berries too and I only pull them out for special things I make them with. Thank you! I’ve really started savory seasonal produce more (and usually end up clinging to summer through my freezer.) I’m really hoping to get canning this summer too! This looks like such a great combination of ingredients. Simple, but with such depth! I’ll have to try this soon. ps- I still get a ton of views coming from your site from when you made my banana chip recipe… wow, thanks!! Ha… that still seems to be one of my more popular post and I’m happy traffic still flows to your sight. I love those chips! 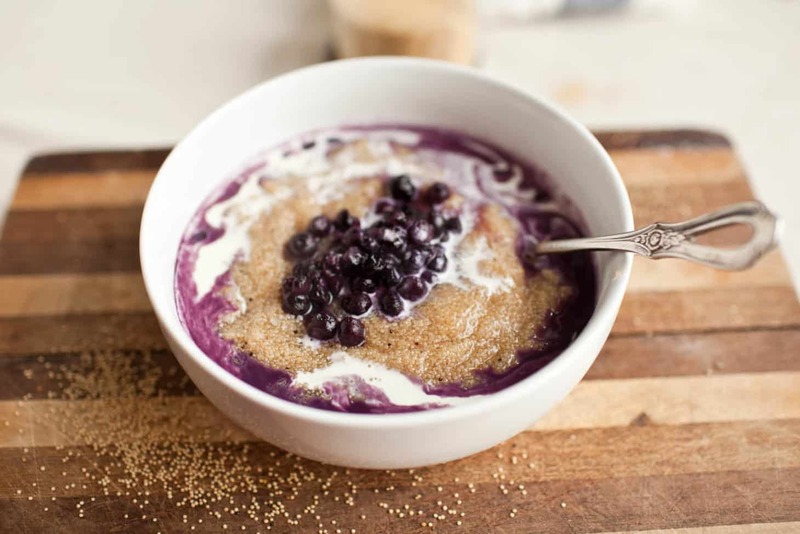 Now this is one delicious porridge! I haven’t cooked with amaranth in quite awhile. I need to change that and make this yummy recipe. This is a fantastic use for amaranth. I would love that for breakfast! 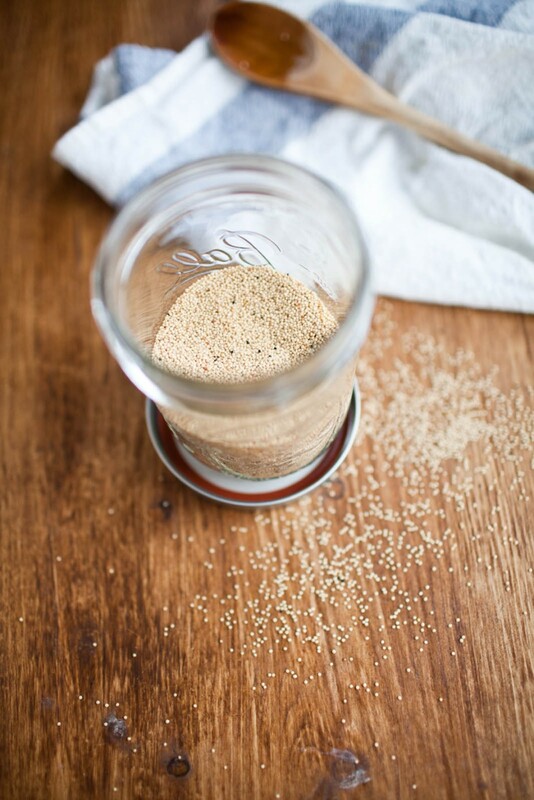 Amaranth is one grain that I haven’t seemed to try yet! I’m not sure what I’m waiting for but this delicious breakfast sounds like the perfect jumping off point! I still haven’t tried amaranth yet! I need to get on that soon. I’m still using up all my frozen berries from last year too, it’s such a nice treat this time of year! I’ve been holding on… I can’t wait for spring/summer! 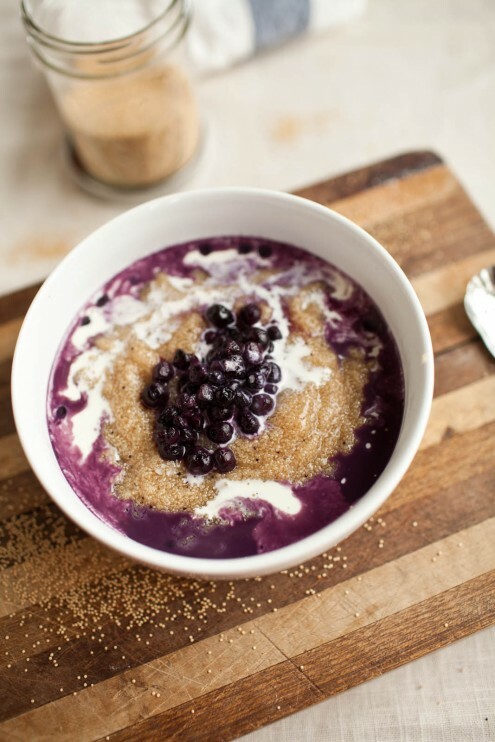 I have yet to try amaranth, but it’s been on my list since seeing Sarah’s recipe, and yours confirms it’s a must-try! What a great idea! I need to get myself some amaranth! Yum ! My stomach is growling. I’ve had similar experiences (not with amaranth, but other things) and I’m starting to believe that it really does pay to be an optimist! amaranth is very high in iron / i ate a lot of it simmered in homemade broth when i was on an iron rich diet for anemia / i like the idea of cooking it in coconut milk and having it sweet instead of savory / going to go soak some tonight ! This looks really good, can’t wait to try it! I was not totally sold on amaranth the first time I tried it, but it has been growing on me. Thank you for the idea! Love this! I too bought amaranth recently, eager to unlock the power of this good grain, but I’ve been searching around online for ideas of what to do. So excited to try porridge! Preparing this recipe right now, but with a mixed berry that includes some blueberries. Super excited to try amaranth! Thanks for this recipe! Delicious! I used a lot of berries, and just wanted to update that it was a complete success. Thanks again! I’ve tried amaranth twice now as a savory dinner side and both times it’s tasted a lot like dirt. However neither of my recipes said anything about soaking overnight. Hoping that’s the key to keeping this from sucking my will to keep trying! is amaranth wheat? Like the wheat grains they sell right next to the oats? If not, where do I buy it? I made this with nectarines this morning for my 3-year-old and I. Very good! Thanks for the recipe! First time I tried amaranth is was a difficult grain to like. I gave it a second try with this recipe and I have to say I liked my amaranth…I just had to add 3 tablespoons of brown sugar. I also added blackberries and it made it awesome!!! I’ve been working my way through the various alternative grains, after being forced to completely change my diet due to ill health. Quinoa and Buckwheat I love, have one of those as a porrige near every morning (with a dollop of butter only). Today I tried amaranth, after scouting around looking for cooking and recipe ideas. I have to say, it was a brown mush (although I was spared having them all over my kitchen) and at first I thought horribly unappetising. however after letting them sit for a bit and a wedge of butter melted on top, they started to look more inviting. Thanks for the recipe idea, and also the link to Sarah B’s blog. Happily, they were delicious! Sort of nutty and crunchy, and creamy smooth all at the same time (I don’t use any sweet stuff whatsoever). I have to say I will be coming back for more. Whoops, those last two paras got somehow twisted lol.